I've been working on a bunch of single bladed paddles for a number of reasons. The first is that I was making a single bladed paddle blank for one of my kayak students. And once I got going on that paddle, I thought, why not make a bunch more. The second reason is that when I make double bladed kayak paddles, I always have some thirty inch lengths of wood left over that I can't use on the double bladed paddles but that are long enough for single bladed paddles. So I got four paddles roughed in for myself, two are the Aleut single bladed paddles I made out of a double bladed paddle that I had cut in half. Go back a few posts for the details on that. And two of the paddles were canoe paddles of roughly Ojibwe style. At least I think one of them is since it's based on lines I took off a paddle I saw at the Ojebwe Museum in Lac Du Flambeau, Wisconsin. 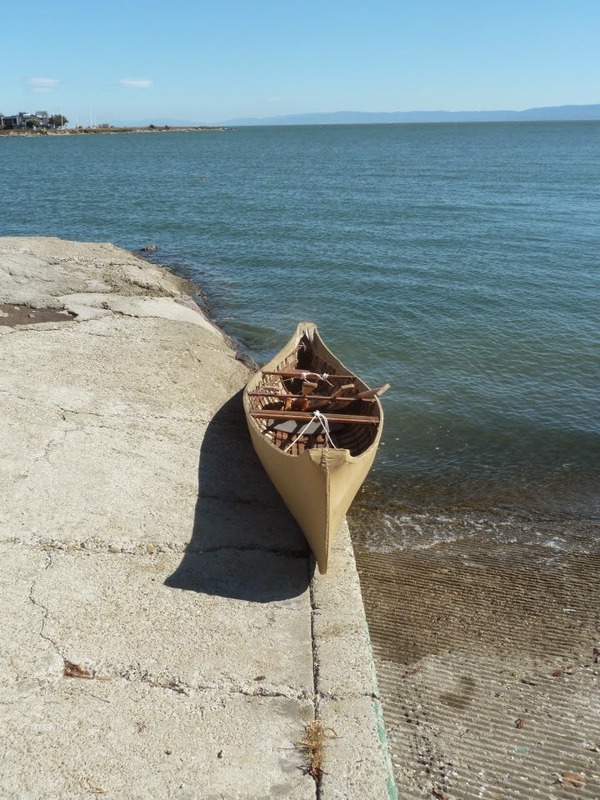 Photo of my SOF canoe at the Encinal boat ramp on SF Bay. The dark blue part is the Bay. The medium blue stripe along the horizon is the SF peninsula. 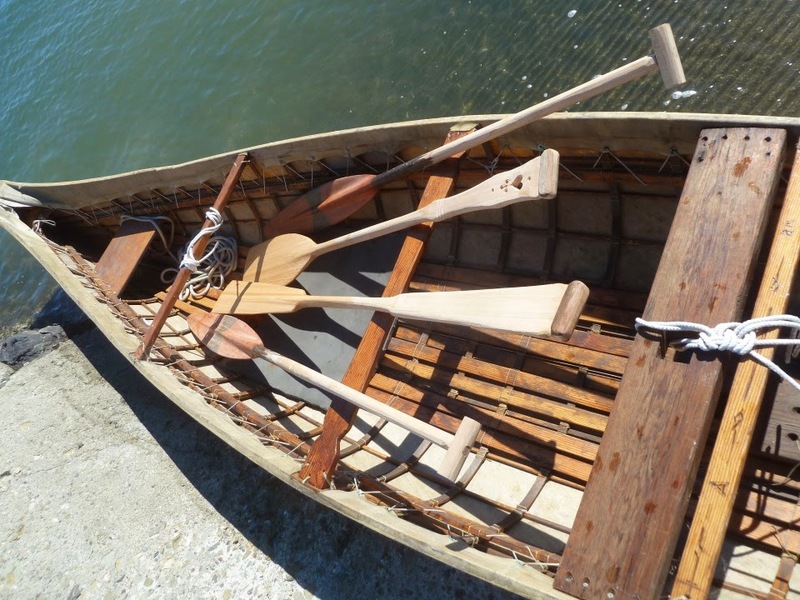 Here's a 3/4 shot of the canoe with paddles spread out for the photo. A better view of the paddles from the blade end. 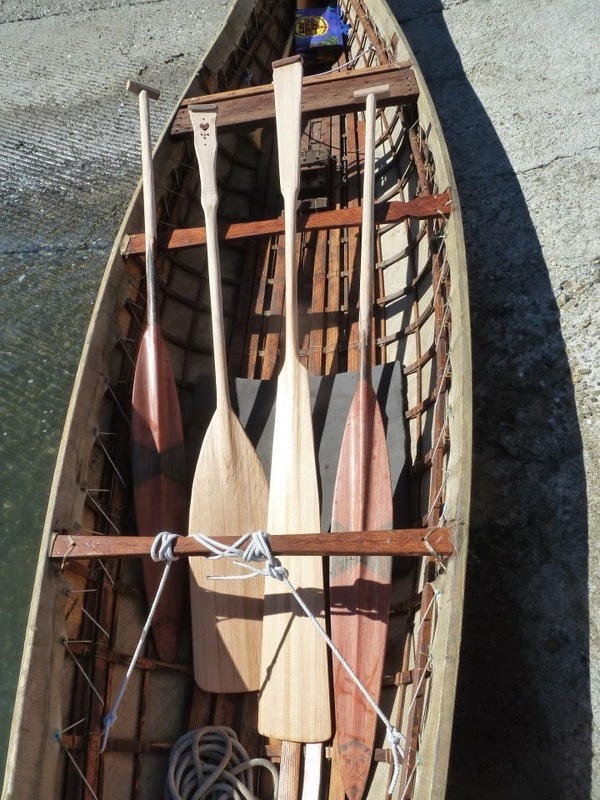 The two on either side are the two halves of the former double balded Aleut paddle. The second from the left has an eight inch wide blade and a length of 64 inches. The third from the left is based on the paddle in the Ojebwe Museum. The blade on that one is six inches wide and total length is 68 inches. And this is a view from the end of the handles. The two middle handles are based on traditional Ojibwe samples. The two on the outside are tee handles mortised to the ends of the paddles. After taking the paddles out I decided to round over the outside edges of the handles some more since I found myself using them with the upper hand on the outer edge of the handle rather than square in the middle as you might think. This is the kind of thing one discovers on tank tests. What found on the tank test was that I really liked the Aleut paddles even though they had less surface area than the other two canoe type paddles. 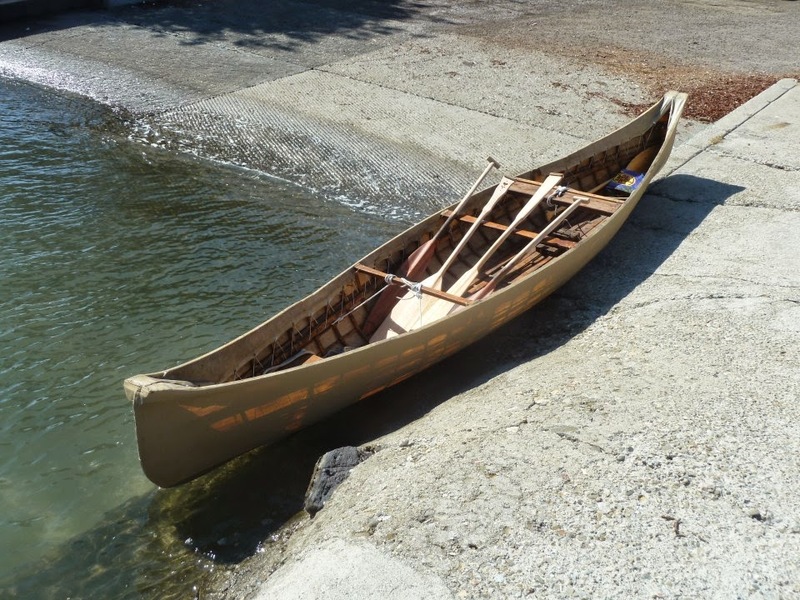 On the other hand, the canoe paddles, especially the one that was 68 inches long worked better for paddling on one side only by transitioning to a rudder stroke at the end of each propulsion stroke. With the Aleut paddles, I had to do two strokes on one side then switch to the other side to get the boat to swivel back in the other direction. I'm not sure why that was, it may simply have been that with the canoe paddles with their bigger blade area I was able to do a rudder stroke more easily. 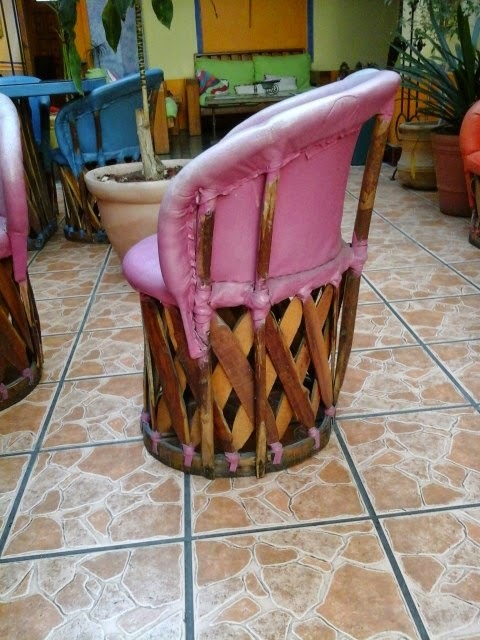 One of my readers sent me some photos of chairs made in Mexico by traditional means. Full view of the chair. Lashings hold uprights to the bottom ring. I recently got back from a trip to Mexico visiting my wife's family. When down there we saw a style of furniture construction which reminded me of skin on frame, in that it involves multiple relatively poor quality pieces of lumber lashed together in a way that makes it both strong enough to do it's job and is also very resilient to impacts. It seems to me that this chair and SOF (bicycle wheels as well) are so strong is because loads and impacts are dissipated by transferred them to multiple small, relatively weak, parts instead of concentrating them on one part that must be thus very strong. The type of furniture is called Equipale and was very common in the state of Jalisco. (I do not know if it is a regional style or a national one). 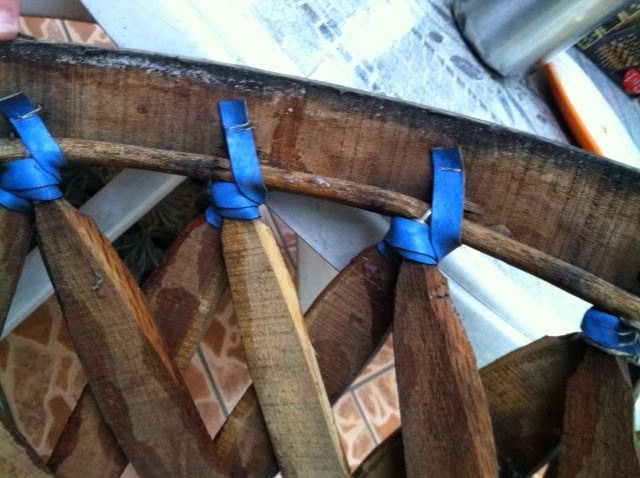 And I'm adding some photos of two chairs of ours that were falling apart because the glue was coming undone. 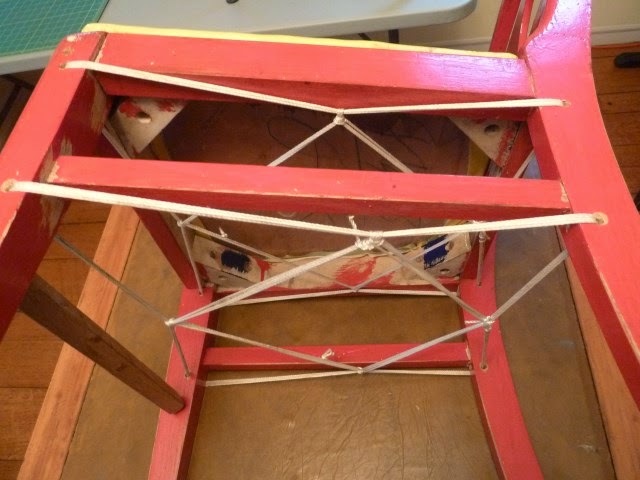 These were chairs where the parts were held together with glued dowels. 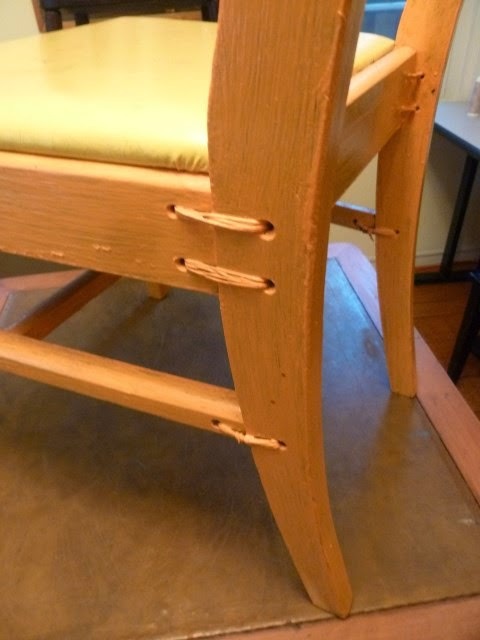 The glue failed and the dowels pulled out of their mortises one evening at dinner while a friend of ours was sitting on one of these chairs. The dowels were still stuck on one end and drilling them out would have been tricky so I just reassembled the parts and lashed around the joints. The chairs now have some movement in them since the lashings don't make completely rigid joints, but overall, they are hanging together. This isn't skin on frame technology, but it is lashed and doweled construction where lashings take the place of glue or screws to hold parts together. 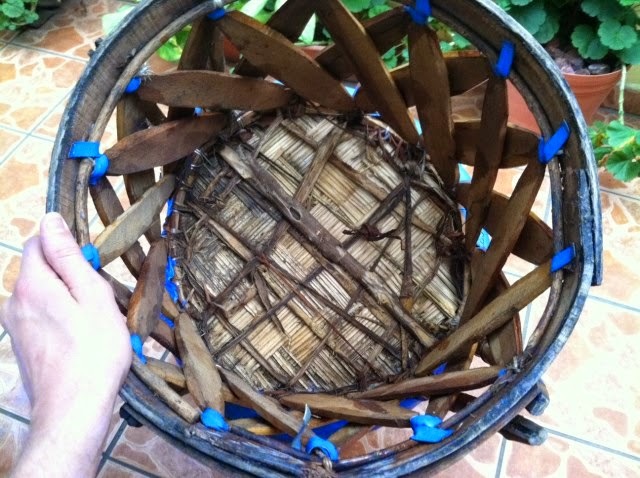 Here I reenforced each doweled joint with a lashing. Even if the glue fails, the joints will not pull apart. The string lashings function like ligaments in animal joints. Here, my lashings pull all the legs toward the center. This approach is less work than lashing each joint individually. Now that I look at this photo, I'm thinking that I should paint the lashing some color other than white. Postscript: I first saw these two chairs at a neighbor's yard sale. I didn't care enough for them to buy them but picked up some lamps. Next morning the chairs sat out in the alley next to his dumpster so I grabbed them. Painted one red and the other one blue and reupholstered the seats in yellow vinyl. Subsequently painted the blue chair orange. I believe the chairs now have a few more decades of life in them. I got my copy of Qaqamiiĝux̂ in the mail the other day. I was expecting a smaller book for some reason. As it turned out, the book is hard bound and a full 8-1/2 x 11 inches in size and has 382 pages. The content is just what the title advertises, a description of traditional foods and how to prepare them. Nutrition information on various foods is also provided along with safety tips. Contents are grouped by food type, marine mammals, fish, birds, caribou/reindeer, plants, tidal foods and other. If you are not an Alaskan Native or a guest of Alaskan Natives, marine mammals will not be accessible to you, but all the other foods are available to the general public. If you were raised outside of Alaska, much of this food will look alien to you, but if you live in Alaska most of it will look familiar. The book contains a good deal of historical information on how animals were hunted and caught, something that might be of interest to kayak builders given that one of the primary uses of kayaks was as a vessel to hunt and fish out of. 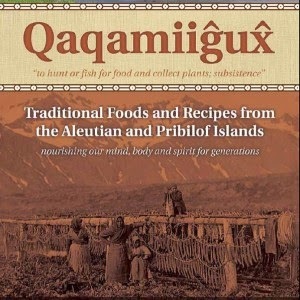 The book contains lots of photos both color and black and white of how the food is gathered and prepared and gives you a good sense of contemporary food culture in the Aleutians. My only complaint about the book is that it is missing the customary picture of the author.